When the sun sets tonight around the world, more than 400 maternity clinics that long labored in darkness will have light. Reliable, robust and easy to use "Solar Suitcases" will provide light and power for midwives and doctors to deliver babies, conduct c/sections, treat pregnancy complications, and care for newborn babies in 25 countries. For many mothers and babies, that light may mean life. 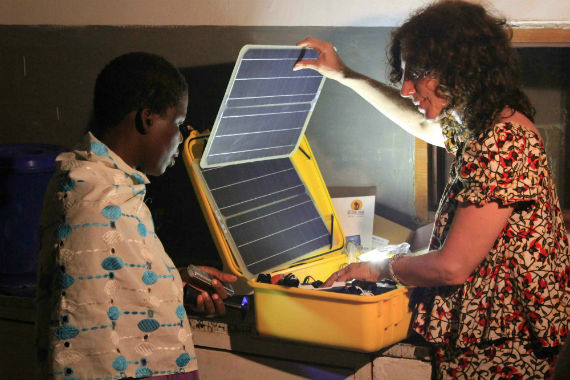 We Care Solar, the non-profit organization my husband and I formed five years ago, created the Solar Suitcase to bring light and essential power to health facilities cut off from modern electricity. For our work, I have the honor this year of being named a "hero" by CNN. The real heroes, of course, are the health workers that work through the night in remote health centers, treating pregnancy complications that claim the lives of 280,000 women each year. But these heroes cannot save those lives - and preserve those families and communities -- without support. With medical lighting, cell phone charging, and fetal monitoring provided by the Solar Suitcase, health clinics can function through the night. Lives can be saved. I know this first-hand from my work as an obstetrician over 14 years. In my clinical practice, I saw many complications -- conditions like hemorrhage, infection, prolonged labor, and elevated blood pressure. Nearly one in seven pregnancies worldwide have some form of complication. In U.S. hospitals, we can handle complications quickly and efficiently. Maternal death is an extremely rare event. The situation is very different in Africa. I was sent to Nigeria in 2008 to observe obstetric care at a state hospital serving a city of 1.5 million people. I was trying to understand why women in Nigeria had one of the highestmaternal mortality rates in the world. The labor ward was filled with women with complications, just like the ones I had seen in the United States. I met talented nurses, midwives, and doctors who devoted themselves to the care of these mothers and newborns. But every month, as many as eight expectant mothers died in that hospital, out of approximately 150 deliveries. It was not hard to determine one major reason. The hospital was without electricity for 12 hours a day. The operating room and maternity ward were often plunged in darkness. Diagnostic and emergency equipment dependent on electricity lay dormant. There was no way to power a blood bank refrigerator and thus, no rapid way to provide blood transfusions. I watched helplessly as women failed to get timely emergency treatment. Without electricity, the hospital was crippled, Surgeons struggled to finish c/sections by flashlight. Babies were born into utter darkness. Pregnant women in need of life-saving care were turned away. My skills, and those of my Nigerian colleagues, were largely useless. This experience changed my life and made me a passionate advocate for reliable electricity for maternal health care. My husband and I designed a solar electric system for the hospital's operating room and maternity ward, and brought in a solar-powered blood bank refrigerator. After the solar power system was installed, maternal deaths in the hospital dropped by 70 percent. Out of that experience came the Solar Suitcase, a complete solar electric system that fits in a portable case. Doctors and midwives have told us that Solar Suitcases have already saved countless lives. The task ahead is large. We believe every clinic deserves the power to save lives. 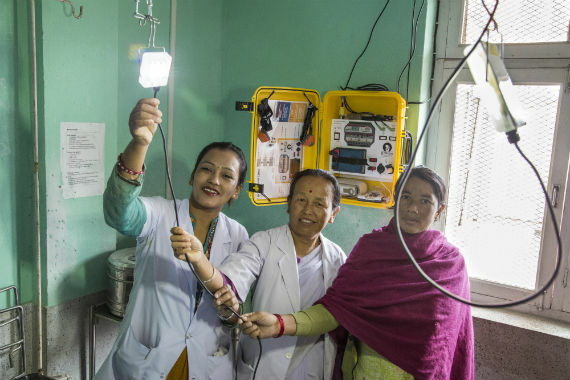 Hundreds of thousands of health centers lack reliable electricity, primarily in Africa and South Asia, where maternal mortality rates remain stubbornly high. The Solar Suitcase demonstrates that it is already feasible, affordable and effective to provide such electricity, so that childbirth can become a more joyful, and less life-threatening, experience. CNN will make a $250,000 donation to the CNN Hero finalist with the most public votes by November 17 - a gift that would enable We Care Solar to significantly improve the Solar Suitcase, making it more powerful and less expensive. That will let us empower - literally - the real heroes, tens of thousands of health workers and hundreds of thousands of families around the world. Please vote for them by going to the CNN site today to help make real the promise that no women should die giving life.